It's that time of year again when Courgettes are in abundance. There is no doubt that seasonal, home grown vegetables are the best but when they all seem to come at once it's a problem knowing what do do with them! 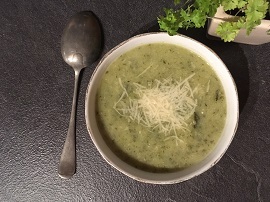 If you are looking for a new way to preserve them, why not try our delicious Courgette & Parmigiano Reggiano summer soup. It is tasty, light and freezes really well too! Heat the oil in a large deep saucepan. Soften the garlic and 3/4 of the herbs and then add the Courgettes with a pinch of salt. Brown gently for 10 minutes. Seasono well with black pepper. Add the stock and simmer for a further 8 minutes. Remove the pan from the heat and allow to cool for a couple of minutes. Blend with a stick blender, leaving some chunks for texture. Return to a gentle heat and stir in 3/4 of cheese, cream and remaining herbs. Serve topped with the remaining cheese and enjoy!